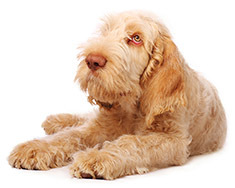 The Spinone Italiano is a strong muscular dog, with a long face and human-like eyes. Their waterproof coats protect them from cold and water. Confused by the spelling of the name? One Spinone Italiano, several Spinoni Italiani. In other words, Spinone Italiano is singular, Spinone Italiani is plural. Easy going and great with kids. The Spinone Italiano originated in Italy. Spinoni Italiani range from 22½ to 27½ inches in height. Spinoni Italiani range from 61 to 85 pounds in weight. A Spinone Italiano may be any color. Spinoni Italiani are said to groom themselves like cats. They require weekly brushings and dead hairs should be hand stripped to neaten the coat. Spinoni Italiani are intelligent and easy going. Highly patient, this dog breed loves children and likes the company of other dogs as well. A Spinone Italiano can be somewhat stubborn and like to do things in a slow and steady kind of way. Spinoni Italiani are prone to several health problems including hip dysplasia, bloat, Cerebellar Ataxia (abnormal gait originating from a problem in a part of the brain). 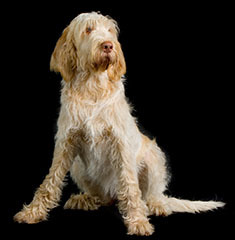 A Spinone Italiano can be expected to live about 12 years or more. Spinoni Italiani require at least mid-sized yards. They are capable of jumping high and therefore need secure fencing to keep them from wandering off. A Spinone Italiano makes a good jogging partner. The Spinone Italiano is in the Sporting Group. Find Spinone Italiano Puppies with our Free Breeder search!